After our Jan 6 - Three Kings Day meeting, Sheldon and I continued to bask in the beautiful energy field we all created together! The next day, we took a drive into the Mountains (of Truckee and Lake Tahoe) just after there had been significant snow fall. It was a beautiful way to transition out of the intensity of this period. Those who “worked” diligently with this process understand what it means to accelerate ourselves along “the way”, heightening ourselves as “atoms” in the body of the Planetary Logos. It is also good to take a breather - a rhythmic inbreath and outbreath. Judy’s idea - in between our times of specific group work - is to daily sound the Great Invocation through the Soul Star Group to serve as a conduit of energy - for Holy Light and Love and Will to come through the Soul of Humanity. Try it and you will understand. I experienced the energy as a great humming potency akin to the “great potency of the Inner Groups”. This simple but potent practice can be the continuity in between the 7 Day Full Moon periods and major “observances” we engage in on the spiritual calendar. If anyone else has practices you have found to be effective in the in-between times, please let us know of them (post them on Soul Conversations, or write me directly: esotericadvent1@gmail.com). Dear Friends - I am posting here three successive "sharings" relating to our Jan 6 (Three Kings Day) meeting. The first one is from Alexandra recapping what she shared with our Group. She begins with writing Jose who had missed our meeting (though he planned to be with us). The next post is Jose's reply to Alex, sharing the gift he had planned to give the group had he been there - and does so now. After Jose's post is a remarkable letter Mirna wrote me at the beginning of our Advent process which I share here now expressing her gratitude for the gifts of the Angels and the deep meaning and significance the Soul Star Group has had in her life. Following these three is a new post from Emi (who found our group just recently) expressing more about the significance of the return of the Holy Mother for Humanity, especially in this century, as expressed by Pope John Paul II (and earlier by the children of Fatima). All these sharing add much to our nourishment and enrichment of the Soul Star Group and the Soul of Humanity. Sheldon and I remain in the glow of Love and Gratitude from our group meeting on Jan 6 / 7. What a joy it was to be with you then, and still now as the energies continue to flow. 1/7/18 The intimacy of our group sharing yesterday on Epiphany Day is still flowing and ringing throughout the ethers. The group Heart is radiating with a gentle love ... nourishing the Soul. With Much love and Joy! ‘O traveler upon the way, I ask you now, have you labored? Yea, say we, it is written in the hall of records, that you have labored much. Ever the law holds true - as ye labor in the joyous path-way of the Angels of the Lord, so shall ye reap the graces and joys that now pursue you ... as true as the Holy breath breathing You ... through You. Sunday, Jan 6 (in the northern hemisphere) - now at 1 pm PST / 4 pm EST / 9 pm GMT. I just placed a poem offered by a Soul Light (Participating Soul) into the Soul Conversations, on top of a reply I wrote very early this morning on a subject near and dear to many hearts among us - that of the Divine Feminine through Mother Mary, in response to a post made by a “Wandering Worker of Old”. It was a joy, and somehow also a spiritual responsibility to enter into the sacred domain of speaking on behalf of the great Ones for our times — the Holy Mother and Her son, and the Father. Prompted through hints, again and again, it appears the time has come for “Christos-Sophia Universalis”. More about this another time. You now have received an invitation with a link to attend an on-line meeting for Epiphany (via zoom) - on Sunday, Jan 6 (in the northern hemisphere) - now at 1 pm PST / 4 pm EST / 9 pm GMT. We would love for as many of you to attend as is possible to gather our joys and gifts to share with each other in “sacred time-sacred space”. Walking Upon “The Lighted Way” is a phrase we all can genuinely say we now know something about, even if but a little when compared with the infinite, endless Path of Light. Sheldon and I want to express our Joy walking this Way with you — and the Companions we feel walking with us in our high and beautiful purpose. May the Joy of this Holy Season continue to unfold and evolve through all of us. Please note there are some beautiful posts that arrived last night and today on the Soul Conversation tab. Please read them. They “in-spire”. On Sunday, we went through the list of Participating Souls and thought to do a better job of regrouping the geography of “Where on Earth We Live” — so some of you will find yourselves elsewhere. We were imagining the sun rising moving westward from the eastern part of the planet and also southward from the north pole. I will be uploading this new list again - the title page Participating Souls remains the same. It also came to my attention that a few Souls had been participating but had not registered so their names are now included after the fact. A new idea arose this morning. Because Sheldon’s posts are so much about the 12 Day process, we decided to create a separate page titled “Sheldon’s Reflections on the 12 Days”. He is following the effect of the energies upon him and us, as it unfolds the Mind of Christ within. You can find this Page with that name — soon. A link to our closing Webinar to be held on January 6 will be coming soon. 12-28-18 Greetings and blessings dear friends in the One Work. Some new posts have arrived in Soul Conversations - two from Sheldon and one from Rebecca. They are marvelous blessings for all of us as they enrich the SSG through which Christ pours His blessings. 12-27-18 There is a special potency in doing these 12 DAYS. Opening to the Presence of the Glory of the ONE reflected in our Consciousness — to the measure we can be sensitive to the very high and potent energy, consciously bringing alive the extraordinary “Heart in the Head” of our divine nature. 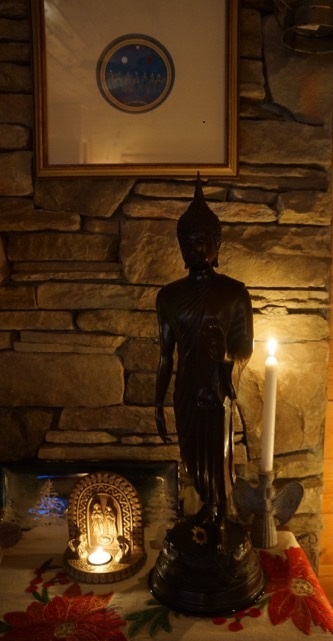 Symbolically, we have two lights with and around us when doing these meditations. The Macrocosmic and Microcosmic. 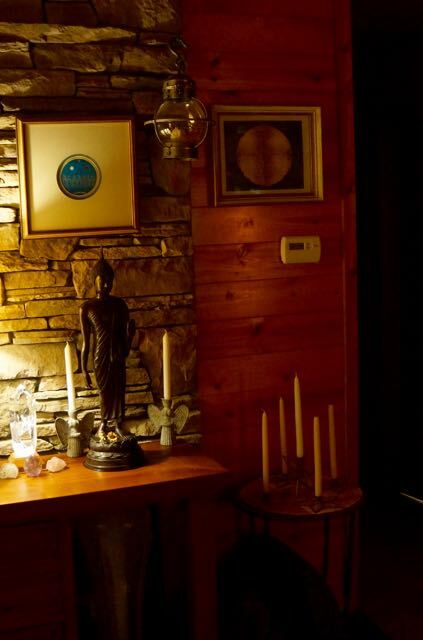 We placed a large pillar candle on a wood pillar near our morning breakfast table representing the ONE (the 12 synthesized constellations) and a smaller tea light sitting inside a ceramic lotus flower of 12 petals representing each new Day (of an individual constellation). Having them lit and burning together has brought something very real into the field of our morning work. Yesterday, we drove up into the high Mountains of Truckee, CA and Lake Tahoe. The mountains were reflecting brilliant white light from the dusting of snow the night before. The rarified cool mountain air, the purity of the atmosphere, and so few cars on the road on this first morning after Christmas carried through the serenity and sacredness — as if the world had experienced its own divinity and did not want to disturb. I was powerfully heartened last night. Just as I was ready to “turn in”, I went to the Esoteric Advent website to once again be absorbed in and impressed by the First Day of Christmas (Aries) as the last thing before sleep. But first, I opened my gmail and found a letter from a participant who had just written 40 minutes earlier. She’d listened to the recording of our webinar on the New World Religion & Meditation for Winter Solstice Day and appreciatively shared what it had stirred and brought to life in her — similar, she said, to what she had done for audiences as a former professional Shakespearean actor in her best moments of performance - that of providing a living experience. Sharing her experience in the way she did was such a powerful confirmation for us of — well, so many things, not the least of which was the deep value of presenting higher teachings and truths of a Master of Love-Wisdom, with invocatory images and soul infused words, into a field of “listeners” who through their soul listening responses — all together created a “living field” that was magnified from on high, giving all of us a living experience of the sacred beyond words. I recall the somewhat arduous process of preparation for the webinar, Sheldon working on his thoughts and me working on mine as I prepared webinar slides until 2 am in the morning of Winter Solstice Day. The preparation process itself was a demonstration of “guidance from on high” because some things I had prepared suddenly disappeared (‘no don’t include this’) and other things came together at the very last minute, literally, just moments before the webinar began. It was the special magic of the Winter Solstice that carries the energies of the Cardinal Cross in the Heavens pouring upon the earth — through which the Cosmic Christ pours HIS Life. In the group meditation, we invoked these energies and were invoked by them, bringing into play the “potentials” of the Sun through one of the four arms of the Cross — the constellation Capricorn, and its rulers — the synthesizing planet Saturn and sacred planet Venus, blessing the Earth Who was in sacred relationship with the Sun on this Winter Solstice Day. The next day was the FM so all these energies co-conspired together. The word profound barely comes close to describing the group experience. (You can still experience this webinar; information about it was given below around Dec 21). If anyone would like to write or reach one or both of us, you can do so through the following email address: esotericadvent1@gmail.com. It is just the two of us, so I receive these emails personally and share them with Sheldon when appropriate. We’d love to hear from more of you - how the Christmas process was for you, what arose for you - what “miracles” happened, and now through these 12 Days. Sharing supports the group process in our Mountain ascents. You can also post your thoughts or sharings on the Soul Conversations tab for all to see and experience. This morning Sheldon vowed to begin making daily posts there, so let’s see if he does! In our morning sharing, he always has so much to say, but his thoughts never quite make it onto a post. Yes, lets help him energetically ‘manifest’ — it’s not fair to the group that I am the only one hearing his wonderful impressions and formulations! 12/26/18 - We began Day One of the 12 Days of Christmas today. We edited The Diamond Soul Practice for Aries today - making it more true. Please go through it again. The idea came that each Sign gives a Soul Gift. Please note, a reminder, that if you have a desktop or lap top open to the tab of Esoteric Advent, you must refresh this tab daily (click the URL and hit enter) in order to see changes, updates, and new uploads. If you do not do this, you will not be seeing new additions. For example, the edits made to the first day of Aries for the Diamond Soul Practice would not appear unless you do so. Today is CHRISTMAS DAY! We are wishing for you a blessed Day and Year of Good Tidings. May these blessings come to and through all of us accentuated today by the Stars present in the Heavens at this time, and the Beings Who grace us with their Love, Holy Will and higher Truths. A few years ago it came to my attention that in the body of Capricorn is a star named Nashira, in Arabic meaning “bringer of good tidings”. This is of esoteric interest to us in addition to the brilliant Star Sirius that led the three Wise Men to find the new born Christ King. Stars, cosmic Beings, are shedding their light always, their light reaching the Earth as a great tide of blessing to all peoples of the Earth. To those who have awakened to and therefor carry within themselves the energy of Good Will — that on a higher turn of the spiral is the “Will-to-Good” for ALL, are especially sensitive to the energy of Good Tidings streaming through Capricorn. Christ brings with and through Him the “Gift Waves of the Christ”. Today, and all through the 12 Days of Christmas (which begins Dec 26) let us be cognizant of these energies and consciously allow them to stream through us and into all our relations. Some new things were added to the Christmas Day page for our deepening and enjoyment. P.S. We would love to hear from more of you — sharing your insights, impressions and miracles. Please scroll DOWN past the SCHEDULE for more comments. To all Participating Lights! These are calendar days, so those of us in the southern hemisphere simply jump a day to the calendar days written below. When it comes to the planetary cycles such as the Full Moons or Solstices, it matters not what “day” of the week it is because these events happen for everyone at the same time on the planet (in your time zone) which is what makes them so significant. The simultaneity of everyone — no matter where you live — receiving the same energy impact of the Cardinal Cross of the Winter / Summer Solstices and Equinoxes for example, is what makes them so powerful and significant. Significant because God (a greater Being of Identification with Reality) Is relating with and speaking to the Earth, and all conscious Souls who live upon — “where on earth we live”. When we tune in together at exactly the same time, we are of One Mind and One Heart of One vast Living System. When this dawns fully upon the mind and is experienced viscerally, a global simultaneous, awe-inspiring and inspiriting Awareness, is the gift. It has been raining here all day off and on, and currently a downpour here in the foothills of the Sierra Nevada Mountains, with snowfall in the higher elevations, all very much needed in California. So much about Christmas Eve is especially sacred. The expectancy in the field carries an energy of purity, guiding hope and conviction that the Light in us and in the Heavens continues to expand far, wide and deep through all who have been preparing for its flowthrough and anchoring. As we continue mounting the higher energy spiral of the Soul - in essence meeting the light waves of Supernal Light released on Winter Solstice Day and the FM of Capricorn the next day — pouring LIGHT and LOVE through the Cardinal Cross in the Heavens, the sensed experience of the Sun apparently standing still is made all the more real for us who are in a conscious state of At-one-ment … . May we continue to be moved inside the Soul Star Group — a radiant Heart of Grace and Blessing. Dec 23: Greetings Dear Soul Lights Upon the Lighted Way! Today is our Sunday here (and Monday in the southern hemisphere). Day 5 of the Full Moon process (see note below on the 22nd) - is good for all of us to go through given that the questions there prompt our reflections for the next three days as the Capricorn full moon energies continue to distribute. Today we have the 4th Advent Lighting ritual for the Northern quarter (and a deeper meditation ritual for those who choose — the 4th Sunday Meditation ritual which continues invoking a deeper aspect of Christ into the Center of the Cross - now as the supernal light of Capricorn is with us, new opportunity from the Heavens is made available for the upliftment of the world to flow through us). Sheldon and I begin our mornings with the Winter Solstice page - it is such a blessing to hear the profound beauty of the Alleluia sung by Constance Demby. Last year (or was it two years ago?) when I constructed this page, afterwards I learned the origin of this song - that she sung it in response to those who lost their lives during 9/11. It is fitting then to have this music during the Winter Solstice in the sign of Capricorn that teaches there is no Death. Yet, we all experience death in the world of form . When it touches us personally with that which is most near and dear to us, we cannot help but experience loss. The recent Paradise fires in northern California where an entire community was wiped out, the many lives lost last year and affected in Puerto Rico after the massive hurricane, on and on. We know death and destruction well. On this day, we gave and continue to give “Oblations to all that we have lost, and to all that we have gained”. I will keep reminding us to see this time period as “One Day” - from Winter Solstice Day, through the Full Moon and days of Distribution, through Christmas Eve night that is Mothers Night and through Christmas Day itself. It is one continuity in the Mind of a greater Being. In my reflections this morning of Day 5, during the Group meditation section asking us to give love and light to the group, I found myself floating up from the horizontal plane of the circle, to hover above and in the Center of the Circle blessing the Group from the altitude of the Soul. Perhaps we’d all like to try this. I sense this is how the Christ also blesses our Group. 12/22/18 - What a blessed period this is … we are sending you our Joy on this Full Moon Day! Day Five for the 7-Day Full Moon Process is now up. It will be good for all of us to attend to this Day —go to the website Tab named 7-Day Full Moon Rituals, Click on the top tab for the 7-Day ritual of Capricorn, and scroll down to find Day Five - which is a review on Sunday. Blessings. By the time you will be reading this, the 4th Sunday of Advent Lighting Ritual should have been uploaded. 12/21/18 A very blessed Winter Solstice Day to one and all. If you missed the webinar and would like to see it and therefore participate while still in Capricorn energy and length of “One Day” up to Christmas, contact Aleksandr by writing: initiative.2012.webinars@gmail.com. And now, the solar Full Moon in the Sign of Capricorn. More to come. Sheldon and I have revisit the page for Winter Solstice Day, several times. It is very beautiful and evocative of the Life energies of Silence, deep Stillness and Sacredness. We suggest going there often. We are in the sacred time and space of “One Day - one Night” all through Christmas Day. We are in the one energy movement of the Solar Logos in relationship to the Earth’s planetary Festivals in concert with Christmas. 12-20-18 NOTE: You can if you wish interchange the morning meditations - choosing one over the other either of the 7-day ritual of Capricorn or staying with the one for Week 3 in in our Christmas Advent process. However, what is NEW in the 7-Day Capricorn meditation is connecting with “the Angel of Capricorn governing the 10th petal in the Head”. If you choose to stay with what is, simply take a moment to open to the Presence of the Angel of Capricorn, imagining the 10th petal (of the 12 petals or energies in ‘the heart in the head center’) being vitalized or stimulated by the Angel; the rest of the meditation is relatively the same. Stay simple, don’t worry whether you are doing it right or wrong, be creative and open to the Solar Angel, the Angel of Capricorn and the Angel of the Lord. I trust they are working creatively and cooperatively with each other and therefore us. Tomorrow is the Winter Solstice ! 12-19-18 Dear Friends — If you received and read an email announcement from me yesterday about the 7-Day Full Moon process for Capricorn beginning today, I suggested you need not add this to the work we are already doing here. However, I now want to amend this suggestion. Capricorn is all about the Light accessed on the Mountain top, and with every full moon period we have the opportunity to move together in Group Approach to Divinity. If you were to include the Contemplation / Diamond Soul Practice at the end of each of the 7 Days to your study and meditation process, it would be highly beneficial because these thoughts are all about the energy of Capricorn and support our group ascent - which is the whole point of Mountain the Third! Today, Sheldon and I added the Contemplation in Day One of the 7 Day Full Moon ritual of Capricorn to our morning process for Wednesday, and were greatly enriched by it. You can do this for each of the subsequent days until Christmas Day which coincides with the last Day of the 7-Day process as well. It couldn’t be more perfectly designed and aligned. In the letter of invitation to the 7-Day Capricorn Full Moon process, what I was mainly cautioning against was adding an additional daily meditation to what you are already doing. Essentially they are the same as what we are doing in the Esoteric Advent-Christmas group process (with the exception of the Angel of Capricorn being added - see note for today above on 12/20/18). I hope this makes sense. To access the 7-Day Full Moon process, you will find it under the tab in the website: 7-Day Full Moon Ritual Approaches, click on Capricorn. Once open, scroll down the page to find Days 1-3 All in One. Day One began today, Day two is tomorrow (Thursday for the northern hemisphere), Day three is Friday, and Day Four is Full Moon Day. Days 5 - 7 follow. 12-18-18 We have been meaning to say the most important aspect of our process together are the daily meditations with the Soul Star Group — a living organism. As we give to it (through our alignments and Meditations, Contemplations, Diamond Soul Practices, naming and loving, and SOUL Presence), the Soul Star Group gives back. As Christ energy flows through it, we are “magnified in the Lord”. Below is an image (a Maitreya Buddha) of the Christ, what I have named “The Walking Christ.” He is not in repose beneath a tree detached from humanity. He is walking openly among Humanity, His hand in blessing. This is what we can expect, in some form, when He actually re-appears. We work for the Christ through this work ~ and all associated connections and projects in the world that are for world betterment, for uplifting Humanity and the kingdoms of nature to higher levels of manifest expression. Today begins the Third Sunday of Advent and tomorrow begins Week Three - now uploaded … ! I’ve wanted to share some “happenings and perceptions” with you several days sooner … which follow below. First, for those who may be interested, there will be a webinar this Friday, on Winter Solstice Day, on the topic of the New World Religion seed group and Winter Solstice Day to which all are heartily invited. Sheldon and I will be offering it through the wonderful “2025 Initiative”: Friday, Dec 21 at 11:00 am - 12:30 PM and will include a Solstice meditation. Some of what I would have shared several days ago now follows. But please know I’m currently writing early Sunday morning without yet having done the 3rd Advent lighting ritual (or Meditation) so more may follow after this if I can find the time to share it. I have photos I want to upload here, candle images, etc. — soon. Before sleep last night I checked my emails and want to thank you Blessed Souls for your contributing comments on Soul Conversations. They touched both of us very much. You bless the group field with your words and deep perceptions. They enrich us all. And this is not to say this is the only way, because we absolutely feel all your work in the field! I woke up this morning inside the energy field of the Angels, realizing once again that consciously working with the Angels brings their activity all the way through into our field of daily living. They do not just remain in the mental or sentient planes. There are grades of Angels as we all know and this morning I was very aware how present they are, effecting the material plane — all the way down. I could give descriptions but you know and understand. Working with the golden-white Angel of the Lord that appears on our Weekly daily meditation has been rather profound. On the first day of this week, I did as the instructions suggest - “Adjusting our focus, see standing in our midst an Angel of the Lord – an Emissary and Divine messenger of The Christ”. For a brief moment, the veil parted, revealing a powerful Angel standing in front of me, facing me straight on, in radiant glory and power and light. The veil closed as quickly as it had parted and I was left stunned by the experience of the reality of Her Presence. On the day when I wrote the Note (mid-week) to experiment with working with this Angel at night before bed, Sheldon and I did that. We opened the page, turned on the music and read aloud what was there, meditatively, and then sat in the silence of this Being’s energy field for a few minutes. That night I was aware of being inside a golden white aura all night long. It was truly profound. And the next night, we did not. What a difference to not have this Being actively in the field with me, with us. It proves the point that there are certain classes of Angelic life where you really do need to “ask”, else nothing will happen. There are other classes of angelic life that are always with us when and as needed. I notice these “Days” have taken on a new and more empowered field effect, and I realize part of the reason for this is the content for the Days of focus are now stable and the “same”. Angels work well with rhythm and content. But what is more, the depth of the Teachings of these points of focus for the Days are bringing up in our consciousness the “depths”, uncovering new layers beyond the surface of what meets the mind initially - however good it may be. For example, on Thursday, I had an appointment in town and when driving home late afternoon, I was on a crest of road about to descend when my mind expanded wide into a broad, expanded state of “well being”. It was a Christ field and I sensed it was the verse from the morning, being inside of the inevitable unfoldment of evolution that has a first ray quality which is a force beyond anything we can stop. It will move all forward on the path whether they want to or not, through slow evolution - a force of Nature. When consciously evolving, we accelerate. Linked with this thought was “I, if I be lifted up, will draw all Men Unto Me.” I sensed having been lifted by the Christ in the updraft of His field, literally lifted up and expanded … where all is well. It was a truly remarkable experience that is with me still. The Madonna Laboris continues pouring through the Group. While in a health foods grocery store on this same day, a woman walked up to where I was standing and asked me to reach for chocolate on a shelf. She said she just had surgery and she couldn’t move her shoulder. I found myself attending to her in a way that was “full on”. As she sensed this energy, she shared, I just had a mastectomy. I felt the Madonna energy flowing through me to her with sweet compassion, healing and blessings. So much more I’d love to write and share - little things and big things that reveal the grandness and goodness of conscious participation in a consecrated ritual dedicated to higher ways of being and living. Another story I would love to share occured in my travels last week but I do not have the time to share it on this forum, better spoken, perhaps on a webinar at the end when we’ve emerged on the other side. Needless to say, we become instruments for these great energies looking to express through us as we open ourselves to them and are willing to take on more. We are with you. And love you. The Higher Vibrations of Love (our Week II focus) have been doing their blessed work to and through all of us in the Soul Star Group. The Chalice is filling with all that we are attuning to and giving, and Christ is adding His magical '“portion” that makes it something entirely new. More than once, I have sensed His gratitude … more than once. I feel so very blessed … and sense that you do as well. 12/15/18 From Participating Soul Light - Simon B. Exquisite! 12/12/18 Thank you so much to everyone who recently made posts on Soul Conversations. Each sharing touched an aspect of truth that fanned and magnified our journey of ascent. In some mysterious way, I hear these sharings ringing in the field, over and over, like clarion bells! About five soul “Lights” have joined the group. Your names have been added to the group of Participating Souls and we are now a group of 110 making the Mountain ascent! We welcome you wholeheartedly. If you have not already done so, simply begin. We are on the Second Mountain - The Higher Vibrations of Love, and tomorrow, December 13, we will be working with “Thursday”. V4 of Participating Souls is now the most recently updated list - of a group of 110. Today is the Second Sunday of Advent. Every Sunday we are asked to do another candle lighting Ritual that not only symbolizes but also invokes esoteric energy into our lives for the sanctification of our lives and for the sacredization of our beloved planet, Earth and Kingdoms of nature. Today is the Second Light, and tomorrow we start Week Two - the Second Mountain. For the Sunday Candle Lighting Rituals, you need the list of Participating Souls and a revised list of names was uploaded today — we are now 105 Participating Souls, and we are a growing global group. Let us hold in our hearts the light and love we have invoked, welcoming all newcomers, as they integrate into our group process! When I first opened the list of names, I felt a thrill in my heart followed by warmth, and then when reading these phrases arriving at the last two lines, I felt an energy of blessing descending from “on high” gently working its way through my crown, head and throat and heart …. It was a truly beautiful, warm, inclusive feeling and flow of energy that was immediately present and not at all dependent on any one individual. The other surprising awareness came during the Second Advent Lighting Ritual for today. At the moment of invoking / welcoming the Angel of the Southern Portal, I sensed the energy of an enormous Being looking down upon the group. As the Angel looked down upon us, I also sensed a feeling of immense love and even gratitude for what we are doing. I also sensed its “location” in a quadrant of the Earth, one of four, occupying a large domain of the Earth for which It is responsible, just as the Others are responsible for Theirs. Today and this year, the Soul Star Group field is feeling much stronger — energetically fuller, deeper and stronger — though our numbers are slightly less than in other years. Do we have stronger meditators this year, are we more committed, is the group made of deeper substance from the former years of building, …? We can expect a few more “Lights” to join us this next week as they hear from each other. After this week, I will close the door for the sake of our group integrity and forward movement “up the mountains” as we work to raise our individual and group vibration, and service through the daily practices. I wrote earlier that being in NY this past week offered the opportunity to bring the energies of the Soul Star Group (SSG) into a planetary Center. We found ourselves standing in front of the statue of George Washington. Afterwards I wondered who he may be today. As the first U.S. president, he stood for true Democracy and those values that supported the fostering of the well-being of all. Often we can ascertain “a current state” through contrast — such as where America is today in terms of ‘values lived’ or outpictured. I see today a direct contrast and conflict with those early values of origin in America as higher values continue to slip and be held captive by forces of materialism and selfishness. In a brief email dialogue with a Participating Soul, she described a powerful meditative experience she had with the SSG, where she sensed George Washington speaking through her - ending with the realization that he is part of the Soul Star Group. At first, this idea came as a shock, even to hear it whether true or not. After some reflection, I came to realize that of course it could be true, and indeed is true, if we consider the 49 greater Ashrams (Centers) of the Christ that exist along all the 7-Ray lines, and the various sub-groups (smaller centers or ashrams) and stages of expression or purpose. The mere existence of the SSG as a vehicle for Christ energy, after we intentionally link with the great “Potency of the inner Groups” serves as a counterforce to the forces of materialism giving space for deeper soul values to hold as well as emerge. A similar parallel is occuring in Europe with Brexit at this time where a decision will be made on Tuesday — this is a critical choice point for whether Europe remains unified or becomes separated. The forces of materialism work through separation and fragmentation. We and all lightworkers must work and live for the manifestation of Unity. The well-being of the world is at stake. Let us invite, think and act Unity during this time — perhaps we’ve been given an opportunity for deeper Unity on a higher turn of the spiral after having brushed shoulders so closely with the forces of ‘separation’ and separative tendencies. It is a blessing to be walking the Lighted Way with you. 12/8/18 So we begin with a new Sunday Advent light and Angel of the Southern Portal. On Monday, we begin the second Mountain! On the plane home, I did some rather minor editing of the Second Advent Light ritual from what I had uploaded a few days ago - it flows better. For those who have already done it, please do not worry about it, the changes are not significant. I just returned an hour ago, and Sheldon returns late tomorrow. We are so looking forward to giving greater in-depth focus. We realize this is a group process and all are responsible for the group field, not simply me or we two. The more we awaken to the Soul and our innate divinity, the more capacity we have to give and to hold the field. And so we count on the Group and the higher energies that flow through it. I’m in process of editing the ritual for the Second Advent Light. It will be uploaded soon in time for our friends in the South Pacific and Africa who are ahead of us in their time zones. I’m still in NY and about to begin traveling early tomorrow morning back home to the west coast. It will be good to be back to re-enter more deeply and fully into this process. Still, we have been and are with you daily in the Soul Star Group. The Beauty of the Plan lives through the power of Truth to raise all that is untrue to the surface, and the ineradicable force of Good to pervade them all. A few more Participating Souls have joined our group process and have been added to the group list (for V2). Several newcomers have joined us this year from T.M’s “All Spirals” group whom we wholeheartedly welcome! Others have joined by word of mouth, and a few through magnetic attraction after searching the www - the “world wide web” — this phrase has taken on new meaning. And those of us who have come together before know the deepening value of the Soul Star Group. A warm and hearty welcome to one and all! If you have not gone to the Soul Conversations tab, please do. There are some wonderful posts to enrich our thoughts and support our unity, including a post by me this evening. “When man functions as a soul, he heals; he stimulates and vitalizes; he transmits the spiritual forces of the universe, and all harmful emanations and all destructive forces find in the human kingdom a barrier. Evil and its effects are largely dependent upon humanity for a functioning channel. Humanity's function is to transmit and handle force. This is done in the early and ignorant stages destructively and with harmful results. Later when acting under the influence of the soul, force is rightly and wisely handled and good eventuates. True indeed it is that "the whole creation travaileth in pain until now, waiting for the manifestation of the sons of God." I’m sensing there are Participating Souls who are participating but who forgot to register. Please do so because we want you visible with us! Greetings everyone. Here we are, now beginning the First Sunday of Advent, and WEEK ONE - The First Mountain. Some posts arrived in the Soul Conversations tab. We’ve not had the opportunity to read them yet, because we are traveling as of this morning. Please read them to move with the spirit of our group - feel free to reply to these or contribute your own! It’s all good. Currently we are in the Denver airport enroute from Sacramento to NY. Prior to leaving home this morning, we did the First Sunday of Advent (at 5:30 am) - and I must say it is a powerful ritual - there are layers of life energy behind it — linking us with the greater Groups, and growing. The Participating Souls list (our names and locations) is not up yet. I hope to have it uploaded prior to boarding the plane, and if not, then during the 4+ hour flight to NY I’ll complete and upload it after landing. Still, we felt the loving presence of the Soul Star group as a whole - genuine and beaming. Thank you for registering for Esoteric Advent - Christmas. Sheldon and I want to welcome you heartily into the group Soul field. Currently we are a group of approximately 70 "Participating Souls". Often we end up with well over 100 but this is where we are now. We want to thank registrants who participated in past Christmas Advents who wrote some words of appreciation and what this process has meant to you and how it continues to deepen your lives. The anticipation can be felt in the field as we embark once again on this sacred adventure of spiritual renewal, heightening of energy, and service to the Christ and Companions on the Way, the Holy Mother Who lives in us all guiding our way upon the earth, and for the holy Company of Angels who participate with us. The Light of Love awaits us as we embark upon the Adventure about to begin in the energy of Entheos.